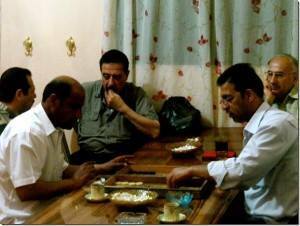 Every Sunday, many Iraqi men gather at CRP to play dominoes, a favorite pastime from home. For many Iraqi refugees, spending time chatting with friends is a much needed stress relief. Many Iraqi men in the community spend their days at home, as they are prohibited from working. Dominoes night provides a welcome respite from the stress, anxiety, and challenges facing refugees. Coffee, snacks and companionship are mixed into the evening’s events. It’s a joy to hear the men’s laughter and camaraderie among domino clicks and clacks throughout the evening.